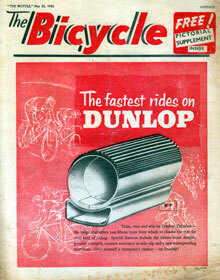 The first issue was dated 25th February 1936. 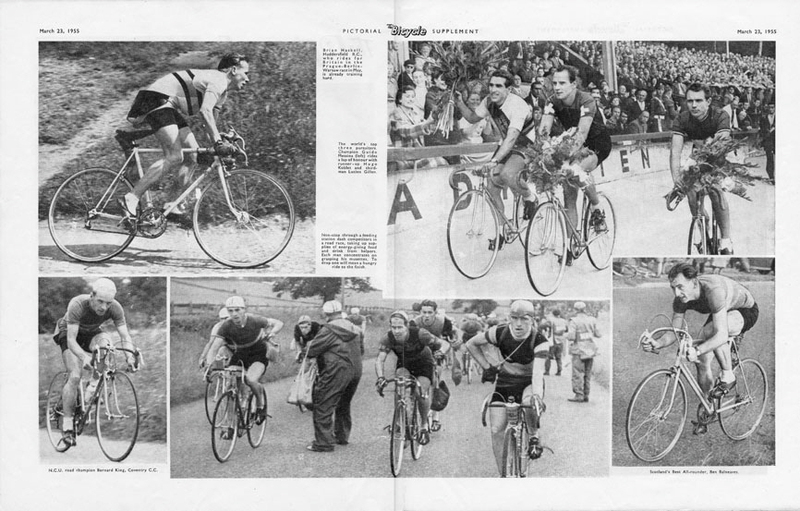 And even though The Bicycle front page looked very much like its weekly rival, Cycling, its content had a less traditional style and more open approach. Feeling less set-in-its-ways than Cycling - a magazine that started out in the 19th century - and generally more “modern” it should have succeeded. However it did not and in 1955 it disappeared into its long-time rival. Just like Sporting Cyclist was to do some 13 years later. 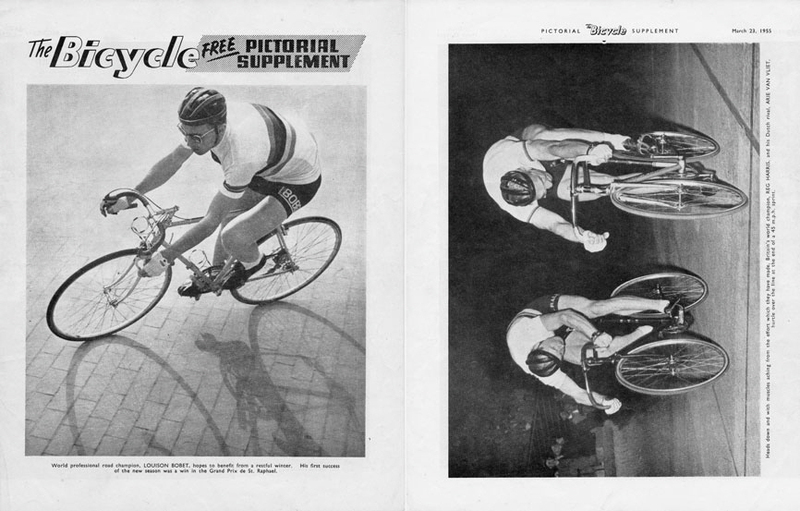 One of the innovations by The Bicycle was the inclusion of a Pictorial Supplement - an attempt to provide some glossy pages of higher quality photographs without adding too much to their production costs. All the examples that we have seen so far date from 1955 so this may also have been an attempt to keep the magazine afloat. Here is a copy of the pictorial supplement from the 23 March 1955 edition. 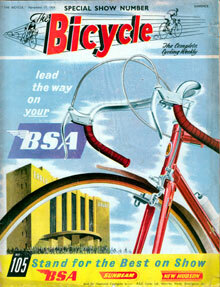 “THIS is the last issue of THE BICYCLE. And a sorry day it is for all those whose pleasure it has been to produce the weekly issues since No. 1 came off the presses in 1936. Nineteen years ago. Nineteen years old now. Not a great age for the demise of a newspaper. The first 10 years, by repute, are said to be the real testing period. We came through that, although around us in the wartime atmosphere other longer-established journals succumbed in the battle. Only recently we were celebrating issue No. 1,000 - and very proud of the many sincere messages of congratulation which reached us from our friends and supporters in the club world and among the industry. But now our journalistic journey ends. This has to be a sad leave-taking for THE BICYCLE staff, who, next week, will be on the outside looking in; looking in when the title of the paper becomes incorporated with the journal "Cycling". Our departure is not like that of some cockle-crusted ship going to the breaker's yard. We have all the virility of a 19-year-old - and some of the impetuosity of youth which, occasionally, has caused our elders' moustaches to bristle and eyebrows to arch. But always our policy has been one of fairness on all matters. The cycling world has, for many years, been ripped wide open by political strife. Our part has been to report each new turn of affairs objectively, to appraise the situation. We have been courted and complimented, contradicted and criticised. The truth has hurt many people. That our efforts to bring about a better understanding between the cycling organisations have not borne permanent fruit is a genuine source of disappointment to us. For, with effect from this week, we of THE BICYCLE staff will be returning to active clubmanship. There must be more than a tinge of regret, too, in the realisation that we have failed to survive, by only a matter of days, the entry of the first British team in the Tour de France. 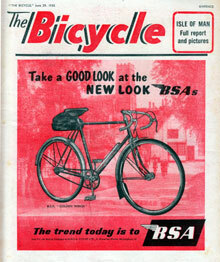 One of the earliest triumphs of THE BICYCLE was to secure the entry of two British riders in the 1937 Tour. And, ironically, after years of endeavour the invitation to enter a 10-man team for next month's race is one of the last outstanding successes to which we have contributed. We charge those to whom our heritage passes to be fair in defence, fearless in attack and always abreast of the inevitable and natural progression of the sport and pastime.